1.We are ORDRO original brand manufacture, offer 12-month warranty and friendly service and please read the user manual carefully before use camera. 2.This video camera with night vision IR light for take photos and video shooting at night is easy to use. 3.Support Anti-shake, unique face detection, smile capture, self-timer auto shoot & camera , IR remote controlled, internal microphone and speaker. 4.Camcorder not only support use an external power bank, but also can be working while being charged. Remote control effective range less than 19.7 feet. 1.Please read user manual be carefully before use camcorder. 2.Please format SDHC card before using camcorder, up to 64GB, recommend above class 6. 3.Please connect to TV through HDMI output or upload the recorded video to the computer. 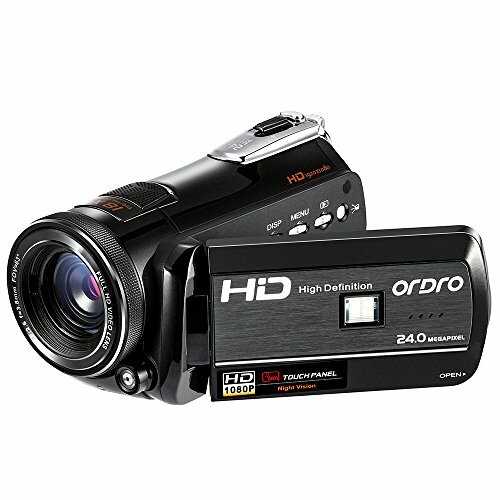 4.This camcorder supports attach an external ORDRO wide angle lens ( FS-1). 5.If you have any questions, please feel free to contact us by email at first, we will do our best service for you. Please add to cart! Thank you. With infrared night vision function, convenience to video recording and take photos while traveling outdoor activities or ghost hunting at night, IR images are black and white. Built-in WiFi, use your phone or tablet to finish the connection. Download "LzxViewer" APP first and then open it to connect and control camcorder: playback, record, photo, download files. WiFi effective range ≤ 9.8 feet. Sony 5.0MP IMX179 CMOS sensor, full HD 1080p 30fps, 18X digital zoom, max 24MP interpolation resolution, camera to camcorder set switch, 2 LED lights, 3.0 inches TFT LCD touch screen. If you close the screen, power will be off. With 2 x NP-120 1700mAh polymer lithiym batteries, charging it up to 8 hours for first time, then 3 hours is enough. Support use external power bank charging. (Note: The battery working time will shorten in WIFI mode). Support HDMI output, standard tripod, wide angle lens, use USB cable connect to computer as a webcam . Approximately 5 x 2.7 x 2.8 inches, weight only 0.82 pounds. If you have any questions about this product by ORDRO, contact us by completing and submitting the form below. If you are looking for a specif part number, please include it with your message.